Abstract: Each year millions of children require anesthesia for surgical procedures. At this age the brain is still developing, and constantly undergoing changes including: cerebral plasticity, synapse formation, and remodeling of dendritic spines. Brain-derived neurotrophic factor is a biomolecule that plays a role in memory, learning and synaptic plasticity. Brain-derived neurotrophic factor stimulates neuron regrowth (neurogenesis), repair, and maturation. Exposure to anesthesia at a young age can effect the developing brain leading to neurocognitive dysfunction and memory deficiency manifesting in the adult years of life. Impaired brain-derived neurotrophic factor from neonatal exposure to anesthesia causes memory deficiency. Environmental enrichment causes epigenetic manipulation, restoring brain-derived neurotrophic factor expression, leading to improved cognitive function. Summary: Exposure to anesthesia at a young age can effect the developing brain leading to neurocognitive dysfunction and memory deficiency manifesting in the adult years of life. 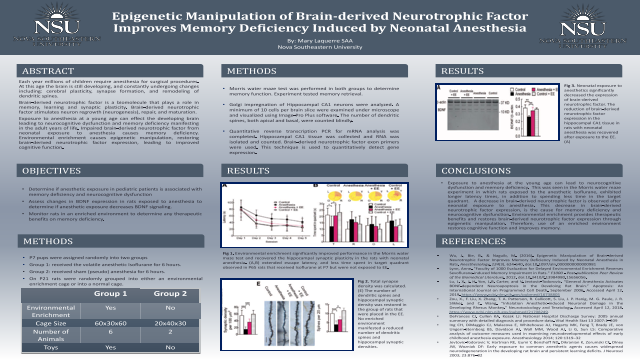 Impaired brain-derived neurotrophic factor from neonatal exposure to anesthesia causes memory deficiency. Environmental enrichment causes epigenetic manipulation, restoring brain-derived neurotrophic factor expression, leading to improved cognitive function. Lynn, Anne. "Faculty of 1000 Evaluation for Delayed Environmental Enrichment Reverses Sevoflurane-induced Memory Impairment in Rats." F1000 - Post-publication Peer Review of the Biomedical Literature, 2012. doi:10.3410/f.13984980.15656056.